The Kickapoo River is the Wisconsin River’s longest tributary. The Kickapoo River meanders for 130 miles from Wilton, Wisconsin to Wauzeka, Wisconsin, where it empties into the Wisconsin River. As the crow flies, this distance is less than half that long, about 60 miles. The name Kickapoo is Algonquin for “one who goes here, then there” and accurately describes the river, which flows in all directions of the compass for portions of its length. Surveys in 1999 and 2000 of the Kickapoo River between Ontario and Gays Mills documented a total of 46 species, including an abundance of brown trout. Since then, the Kickapoo River has been classified as a Class II trout stream from Wilton to Gays Mills. Trout use this section of river for food and shelter, but likely spawn in tributary streams. Streams classified as Class II may have some natural reproduction, but not enough to utilize available food and space. Therefore, stocking is required to maintain a desirable sport fishery. These streams have good survival and carryover of adult trout, often producing some fish larger than average size. There are 5,929 miles of Class II trout streams in Wisconsin and they comprise 45% of Wisconsin’s total trout stream mileage. 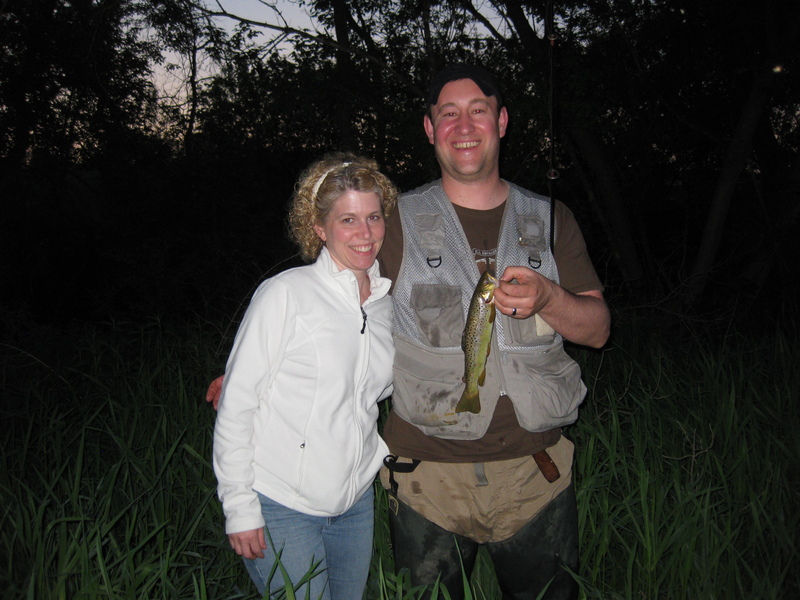 For further information about Wisconsin’s trout streams and fishing regulations visit http://dnr.wi.gov/fish/regulations. Our guests Eric and Jennifer of Sheboygan, Wisconsin were pleasantly surprised to find out that the Kickapoo River was only a few yards from Amil’s Inn Bed and Breakfast. Eric being an avid fisherman took advantage of his stay by fishing the Kickapoo River on both days of their stay and was successful as the picture indicates. Amil’s Inn Bed and Breakfast strives to give our guests a special and memorable visit to the Kickapoo Valley. Eric’s fishing success triggered an idea of having a special location along the Kickapoo River for relaxation and a location to enjoy the scenery of the Kickapoo River and maybe throw out a line!